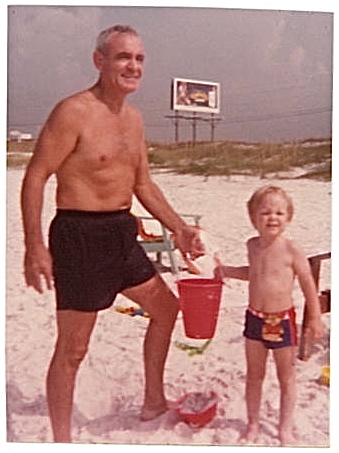 My grandfather – my Mom’s Dad – is the patriarch of our family. All us grandkids grew up around his and our Grandmother’s house – and we all grew up in their love. My brother and I spent most of the Saturday nights of our childhood at their house. We’d eat a wonderful dinner that my Grandmother would prepare for us, and then we’d watch the baseball or football game on TV with our Grandfather, or we’d play basketball, or baseball, or football in their yard with him. They supported two of their own children financially for most of their adult lives, including supporting their four grandchildren – of which I am one. Our family grew up in Poppa and Grandmommie’s love. We lived in – and were holistically supported because of – their love. No one could ever question how much their kids and grandkids meant to them, or how deeply they loved and cared for us. Their love was probably one of the closest earthly approximations of unconditional love I’ve ever seen. But if there was one thing we were all sure of besides their love for us, it was that you did not disobey Poppa and get away with it! We all loved Poppa, and we all also had a healthy fear of him! He didn’t let us get away with disobedience or having a bad attitude or mistreating each other. He did not tolerate us breaking his rules – which were all just and fair rules; he never required things of us that were not for our own good or for the good of the family. If you broke a rule, you could expect to be disciplined for it. We all love Poppa so much. To this day, he is by far the most revered member of our family. We all respect him. And growing up in his house, we all respected his rules, because we knew he was a loving, Godly man of integrity, and because his rules were right and fair and for our own good. Of course, we didn’t always obey them…! And even though we didn’t enjoy it at the time, we understood why we were deserving of discipline if he was giving it to us. And even though he may be mad, we knew the reason he was so angry with us was actually because he loved us so much. My grandfather is not God, but I see a lot of God’s character in my grandfather – particularly his love for his family and his devotion to doing the right thing, even if the right thing hurts. There is a section in the Bible between the Psalms and the New Testament where we see these two characteristics of God – His profound love and His devotion to doing what is right and best even when it hurts – we see these two characteristics of God demonstrated among the people of Israel and the nations that surrounded Israel. This section of the Bible is known as “The Prophets”. In the next post, we will dive into the Prophesy of Amos, where we can see these two primary characteristics of God – holiness and love – working together in His relationship with His people. God disciplines those He loves.